It all started when the following tweet showed up on my timeline. What a brilliant idea, we can finally have a PCB ruler to accurately measure objects in fractions of a banana. 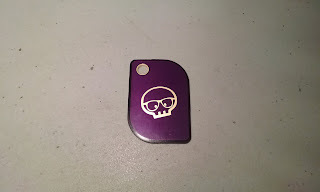 The order was placed with @Oshpark and 2 weeks and $9.50 later, three of these showed up in the mail. It's absolutely beautiful. The copper layer is exposed to form the shape of the banana, the numerals and the manufacturer logo in the back. The color of the ENIG (electroless nickel immersion gold) coated copper perfectly represents that of a ripe banana. Technically, this is a beautiful board. The PCB is a custom shape, a rectangle with adjacent corners having a different radius, but opposing corners radiused the same. The copper layer is the same shape as the PCB, but kept away from the edge 1/22 banana. 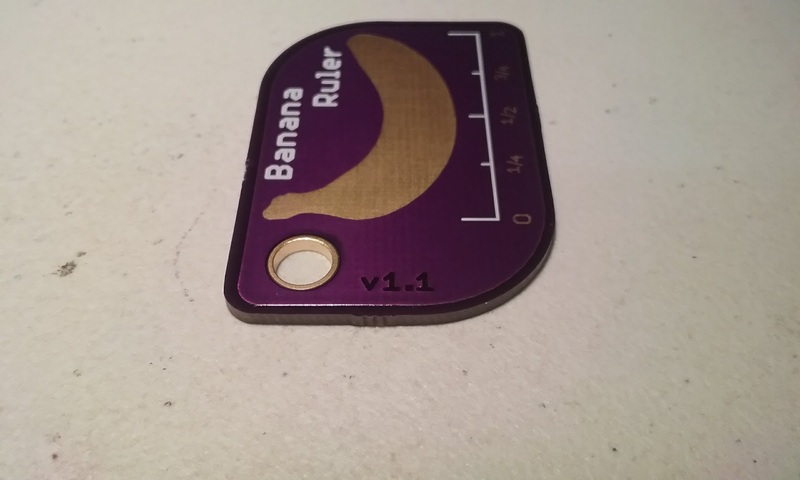 The PCB version number has been written as a negative space in the top(?) copper layer. The use of negative space continues in the soldermask layer. 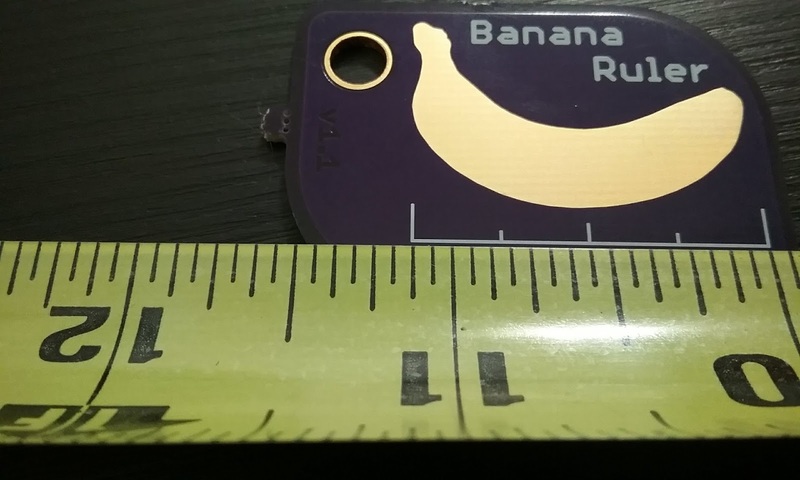 Both the shape of the banana and the numerals are in negative, exposing the copper underneath. No such tricks were employed in the silkscreen layer. 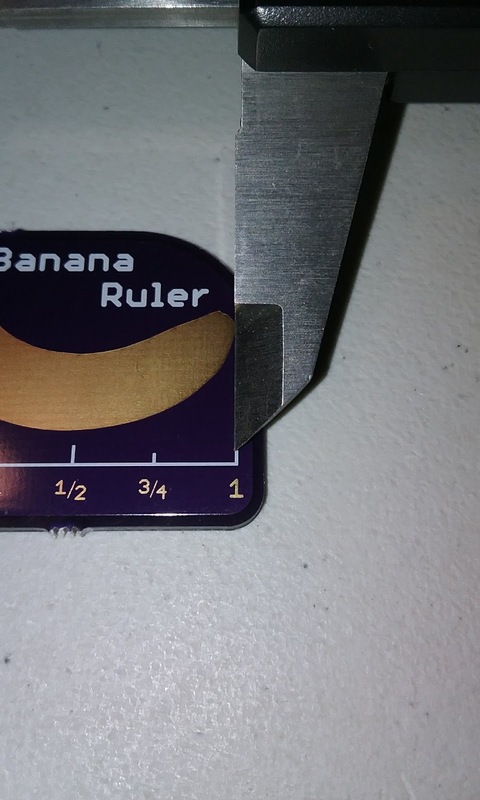 The words "Banana Ruler" and the ruler line are unremarkable. A generous hole has been provided to attach this to a keyring. The inside of the hole has been plated. And now, for the question I am sure everyone is asking themselves. 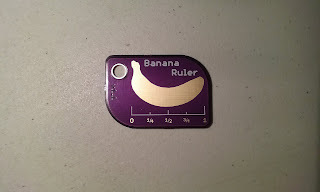 What is the conversion factor between the banana scale, standard and metric units. 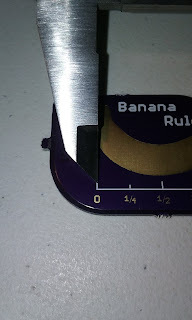 The banana ruler end tick mark was carefully aligned with a Stanley tape measure. The other end of the ruler seemed to be a cat hair over the 1 1/8" mark. A set of digital calipers were used to measure the inner distance between the end marks. 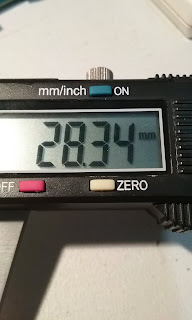 28.34mm seemed too little. 28.35 was too much. And there you have it. 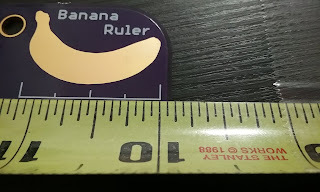 I highly recommend everybody gets their own Banana Ruler to insure the smooth flow of commerce and exchange of technical information. This is a quality product that with proper care should last you for a long time. Here is a link to the Dirty Engineering's Banana Ruler shared project at Oshpark.